I apologize for my abscence earlier this week. My family lost a good man over the weekend. My grandfather passed. He was the embodiment of a healthy active life. Served in the Navy during WWII. That’s back in the day when soldiers had to be in good shape just to get in. After that he was a postman. Walked his route for 30 years. He ate good food and enjoyed a good life. Lived to be almost 93. A testament to healthy living, and a legacy that both sides of my family share. The habits that his generation taught my parents, they in turn taught to me, and I am currently trying to instill those same healthyvalues in my own children. Life can be good, you just have to make it so. Rumors has it that the government is trying to take away some of our dietary choices. Another discussion for another day. Have a good one, and make the best of it. In the 1960’s the USDA gave us a gift. Since, apparently we were not capable of feeding ourselves as we had for hundreds of years, they decided to give us a gift. They put out the Food Guide Pyramid. This was the gift to keep on giving. Letting us know how to eat and what we should put in our faces. Nevermind that it went against most of the accepted research at the time, and was put forth by Joe McCarthy (who was a staunch and noted vegetarian, by the way). Now, let’s understand this gift, so we can be properly thankful for it. At the very base of this eating guide, we find our grains. 6-11 servings per day. Do you all know what 2 of the biggest crops in the US have been since the end of WWII? Corn and Wheat. Did you also know that 2 of the 3 largest GM (Genetically Modified) crops around are corn and wheat? The wheat of today and the corn of today are absolutely nothing like what we had back in the day. The people who spray pesticides on corn have to wear biohazard suits to do so, but we can just munch on it? Really. The wheat has been so genetically altered in order to increase yields that many digestive systems don’t even process it properly. Now, in the in-between, we find fruits, veggies, legumes and proteins (however the portions of these are sadly lacking). And up at the top of the pyramid we find sugars and oils to be used “sparingly”. Now, sugars, fine. Too much processed sugar can lead to all sorts of health issues, and that’s OK (even a blind squirrel finds a nut every once in a while). But oils. Let’s talk about oils? What type of oils are we recommended? Polyunsaturated vegetable oils. Do you know what makes up the 2 most recommended oils? Soybean oil (basic vegetable oil) and corn oil. Do you know what that other top 3 GM product is? Soybeans. Do you know how to derive oil from an olive? Squeeze it. From a coconut? Press it (because you can’t squeeze a coconut, silly). Hold and ear of corn or a soybean in your hand. Where is the oil, and how do I get it out? I heat it and treat it with enzymes so that it doesn’t rancidify and breakdown on the spot. But that’s what is good for me? So, you have to ask yourself about this gift. Who was it a gift to? The general public? Probably not. How many of you actually believe that any department of the government TRULY has YOUR best interests at heart. You know better than that. The pyramid was actually put out to regulate food intake to help the farmers. Now, I’m all for that, believe me, few people work as hard as they do. But the restrictions they put out are a little bit ridiculous, and have taken their toll on our population. Look at what’s happened since the first food guide came out. Obesity, diabetes, chronic disease? All have been rising at alarming rates. There has to be a connection there, right? Probably. Remember, just because they tell you it’s good for you, don’t take it at face value. Do your research and find The Truth. So there you have it. I’ll usually take a recovery day about every 2 or 3 workout days. Keeps the body fresh and allows it to recover. Go get ’em! I’d like to piggy back on an idea that I have written about before and a colleague of mine was good enough to remind me of yesterday with a well played post. So help me if I see/hear one more idiot trainer tell their client to “push through it” when the client says they are feeling pain. No pain, no gain is just stupid. Pain is your body telling you that you are not doing something the right way. If I’m doing KB swings, they shouldn’t hurt my back. They do because I’m rounded over, or not using my hips the right way, or something like that. I am not going to push through it. It’s trainers like this that give the rest of us a bad name. Uneducated rep counters who got a cert by reading a book over a long weekend somewhere. I swear that the next time that I hear it or see it, I’m going to find the nearest medicine ball and hurl it at the back of their head. Maybe the ensuing concussion would make them think twice before hurting someone else. So, as that happens, odds are that I will end up in jail, so subsequently I’ll need someone to post my bail. I’m pretty sure that it’s all justified, so it’s OK, right? Did you know that the United States government puts out recommendations with the help of research organizations every couple of years to give the population something to shoot for? Did you know that the current recommendations state that in order to lower your risk of heart disease and pesky things like early death, it is suggested that we get at least 150 minutes of moderate activity per week OR 90 minutes of vigorous activity each week. Moderate activity is defined as anything about about 50-60% of your max. Examples would be a light jog, elliptical, cardio, any lifting, etc. Vigorous activity would be at or above 80% of your capabilities. Examples including Crossfit, P90X, Boot Camp, HIIT training, etc. So, basically if you can make it to the gym twice per week, and then cut your own grass, you meet these recommendations. Did you know that only between 1 in 7 and 1 in 8 American adults meet these relatively loose requirements? Yikes. No wonder we are fat and behind the rest of the world. It really doesn’t take that much. It doesn’t even need to be work in the gym. Jump rope, run with the dog, hell, run with the kids. The point is is that these guidelines SHOULD be blown away by most people, and yet we fall further and further behind each year. do something about it. Get up, get active. Count your minutes and watch your health improve dramatically. First of all: Can I call you Charles? I know that isn’t your name, but I’ve always wanted to write someone a dramatic letter that began that way. You’ve been my personal trainer for several months now, and over that time, I’ve really begun to feel as though you were someone I would like to call Charles, at the beginning of a dramatic letter. Secondly, I want to apologize for our recent lack of contact. I got your holiday card, with Santa bench-pressing a menorah. That was nice, and I’m referring both to the sentiment and the fact that you were so culturally inclusive. Did you know that technically, reindeer meat is paleo? Ha ha, just a little belated holiday humor for you. OK. Look, I know. I have not been showing up to our regularly scheduled workouts. But I have a good excuse. For one thing, work has been really busy. It used to be that I had time to pump some punishing iron with you after leaving the office, but I’ve been staying too late to hit the gym. Sometimes, I’m just not ready for that huge endorphin rush so close to bed, at 9 p.m. I wonder how many calories are in “the midnight oil,” because you might say I’ve been burning it! For another thing, I am dealing with what I am fairly certain is a repeat stress injury in my right hand. Maybe it’s because I use my phone quite a bit (for work, and tracking calories), or maybe it’s because the new gloves I bought for jogging are weirdly tight, which is why I have only used them for lower-intensity activities, like short elevator rides or walking from the office to a cab. In any case, my one thumb is just constantly sore. A thumb doesn’t sound much but just try to go a day without using yours! I did once, when the Internet was down at work. I told my doctor that it hurts when I bend my thumb, and he said, “Don’t bend your thumb.” I don’t have insurance and these free clinic guys are real clowns. Furthermore—and I’m not sure if you know this—but Christina Braverman has been fighting a serious illness, which has been very hard on her son, Max, who you may recall has autism. The whole thing has been a lot for me to deal with, emotionally. The Bravermans are characters on my favorite NBC dramedy, Parenthood. I hope you’re not worried that I have not been exercising in the interim. I’ve participated in such diverse athletic competitions as billiards, darts, which are officially all classified as tournament sports, according to Wikipedia. True, OK, yes, these are both activities that can easily be negotiated while eating nachos in a bar, but you can see the word “sports” there, plain as day. I don’t make the rules. I have also been keeping up my health in other ways, like drinking lots of water, if the taste of Coors Lite is any indication. Kidding! Ha ha, but it’s true though—pretty much everything is made of water. Technically even beer. Additionally, I’m making the smart food choices we talked about. I’m always sure to read the labels on everything. In fact, this is my favorite new thing to do when I am resting my thumb. I can tell you how many calories are in any number of products, like pretzels, and I pay attention to things like serving size. For instance, after I eat a bowl of pretzel nuggets, I’m confidently able to say to myself, maybe while I stare into a mirror, “That was a pretty enormous serving of pretzel nuggets.” You can’t win every day, and I know it’s important not to beat myself up when I have a bad week or two, nutritionally. The important thing is that I feel good, and my pants are looser. (In addition to gloves, I also bought several new pairs of “comfy pants.”) I wanted to tell you that I genuinely miss our time together. It may not have looked like I loved running up and down the gym, holding a medicine ball over my head with one hand while trying to keep my sweatshirt from flying up with another, while you stood there and shouted encouragement at me. You have no idea how inspirational you have been. Sometimes just seeing somebody who looks a little like you on the street is enough to make me emotional, which is why you may have seen me crossing the street hastily, if indeed that was you. I hope 2013 is going great for you, Charles, and maybe we can start again. Of course, we’ll have to wait until after the baby is born. I mean, of course, Kim and Kanye’s. So, this could be called Exercise Myth #2, in keeping with our recent theme. But what I want to point out is that contrary to popular belief, running and walking are NOT the same. The premise goes like this….if you run a mile or walk a mile, it doesn’t matter. 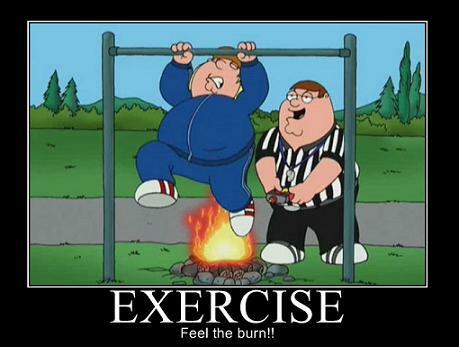 Since you went the same distance, you will have burned the same amount of calories. Shorter and harder in the run and slower and easier in the walk, but the ultimate effect is the same. Well, as it turns out, that is completely untrue. In a study published in 2010, we conclusively proved the following. Bear with me for a second, and I’ll explain fully. OK, so here we go. Take 2 people, one walker at 3.0 mph (a good pace), and one runner at 7.5 mph (about an 8 minute mile). Now, in theory, they should burn the same amount of calories in the long run, right (pardon the pun). But lets do the math. If we follow our formula for the runner, (0.2 x 7.5) + (0.9 x 7.5 x 0) + 3.5, we come up with a caloric expenditure of about 114 calories expended in 8 minutes (after we get the VO2, we can convert to kcal/minute. Trust me on this one). Anyway, if we do the same for our walker, we come up with the following…(0.1 x 3.0) + (1.8 x 3.0 x 0) +3.5, and after our conversions, we get a caloric expenditure of only 75 calories in more than double the time. The difference comes out to about 52% for those keeping score at home. So, it’s not the same thing. Walking and running are NOT equivalent provided you go the same distance. The walker would have had to walk an additional 12 minutes ON TOP OF the 20 minutes already accomplished to equal what the runner did in just 8. So, the ultimate answer, as always, is work harder. Good day!